Delaney told me she keeps getting “all the coin money mixed up.” It probably doesn’t help that her sister can count her piles of coins without any help. 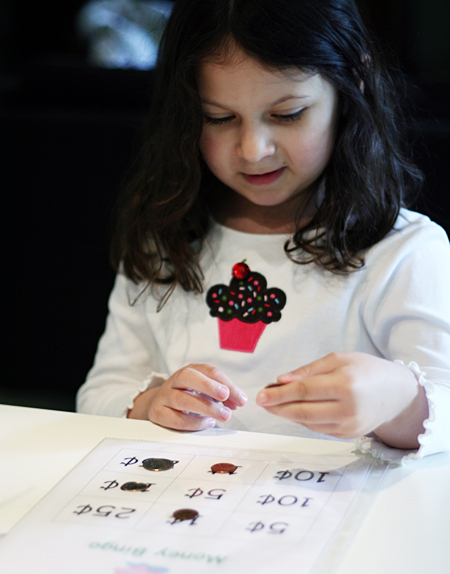 So, we’ve been playing a very simple money bingo game to work on those pesky coin values. Delaney loves bingo, so I can pretty much give her any skill in bingo-form and she will happily play! 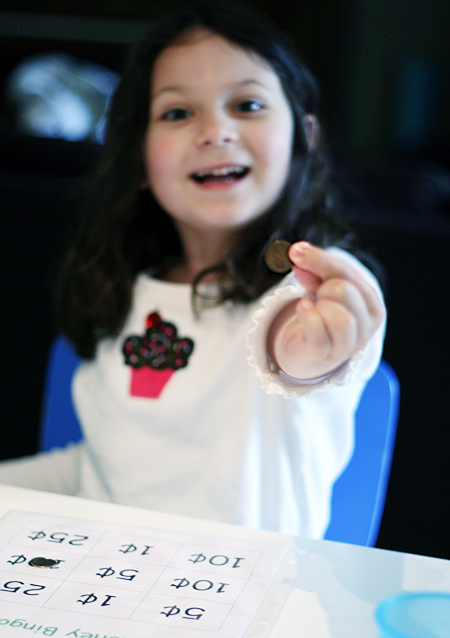 To play, you will need a cup of coins and some bingo boards with coin values. You can make a couple boards with your child, or print ours if you’d like. After each player has chosen a lucky board, take turns picking a coin from the cup and placing it on the matching value. If you don’t have any more spaces for the coin you chose, put it back and lose a turn. First person to get three-in-a-row says, “Bingo!” We also like playing blackout, where the whole board has to be filled. Just for fun, we’ve also been reading Loreen Leedy’s Follow the Money! , Rosemary Well’s Bunny Money , and Judith Viorst’s Alexander, Who Used to Be Rich Last Sunday . Don’t forget to download our money bingo boards for a quick game. Have fun! Great idea! My oldest is only four, so we’re not there yet, but I’m saving this in my “future activities” file. Yesterday she was SO thrilled that she gave only two coins (a Canadian dollar coin [loonie] and a quarter), and she got back FOUR coins–four pennies ;). Oh my goodness! Thank you for this! What a great idea! Thanks, that’s a great help. We also make the “day” out of money during calendar time. For instance, today is the 8th…8 pennies, for a nickel and 3 pennies. That is such a great idea! money is a tough one and this game is such a fun way to help out. Thanks so much for this, I’ll be spreading the word. Thanks! This is perfect timing! I need to work with my son on this concept before he heads back to school! I just recently started my blog, but I have been using this game I found on here for over a year! It makes a great game for ending a lesson on coin values :) THANKS FOR SHARING IT!